November 15, 2017 – Col. Jack Fischer, NASA astronaut, met with more than 70 Schriever Airmen and family members at the event center November 13. While at Schriever, he spoke about his Air Force and NASA career, as well as his time in space. Fischer recently returned from a mission aboard the International Space Station, spanning 136 days. 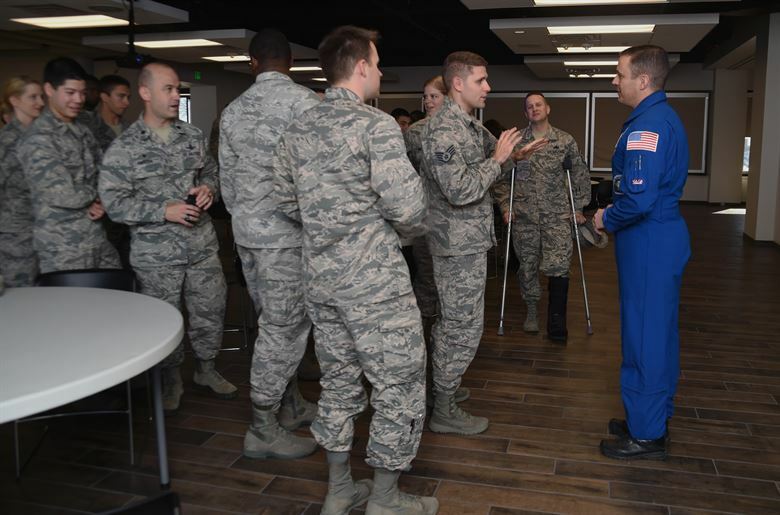 The purpose of his visit was to bring awareness of the Air Force Space Command astronaut program and what Air Force astronauts do in conjunction with NASA. Additionally, he aims to educate and inspire others about the program sharing how science, technology, engineering and mathematics relates to service in the Air Force and how it is key to becoming an astronaut. Airmen and children in the audience viewed a video of his team’s mission in space and then had the opportunity to ask questions. A common question asked was what his favorite part was from being aboard the International Space Station. Once the event was over, base members expressed how meaningful it was to meet with Fischer about his career and the opportunities he has had. One of those Airmen happens to be an old college roommate of his. Capt. Emanuel Chatters, National Reconnaissance Office launch operations director, echoed the sentiment. While Fischer enjoys talking to everyone of all ages about his career, he said it is especially meaningful to him when speaking with elementary and middle school children. During his time in Colorado Springs, Fischer visited Schriever Air Force Base, Peterson Air Force Base, USAFA, Memorial Hospital, the Space Foundation Discovery Center, the Boys and Girls Club of Colorado Springs and the University of Colorado, Colorado Springs, College of Engineering. Fischer added how thankful he was to visit with the Schriever community.